We Love Arts: Ah, Wilderness! Nostalgia has been on the minds of Americans more than ever. Pop culture junkies are writing about it, those disillusioned by our current economic times are looking back to sunnier days, and Hollywood is playing to our nostalgic tastes more than ever with remakes and reboots of shows and films of yesteryear. This isn’t a new phenomena, in 1932 Eugene O’Neill wrote “Ah, Wilderness!” as a fond look back to the mood and world he grew up in as a teenager. It is a certainly a world viewed with rose-colored lenses, O’Neill grew up in a less than perfect home full of alcoholism and philandering yet in Arena Stage’s production we are presented with a more idyllic vision: a warm, fuzzy home where the mood is relaxed like a night sitting on the porch sipping an iced tea. 17 year old Richard Miller (William Patrick Riley) is spending his summer at home before embarking to college. Still a rebellious teenager, he is enlightened by the works of Oscar Wilde and George Bernard Shaw. Full of new anarchist ideals, he has become a cause of concern to his mother Essie (Nancy Robinette) as well as local business man David McComber (Leo Erickson). Richard has taken a liking towards McComber’s daughter Muriel (June Schreiner). However, one shouldn’t be fooled by his newly found political views, Richard is still terribly innocent when it comes to the idea of love. Richard and Murial’s dedication to abstinence until marriage is both an homage to a more simpler time and a hilarious idea in a world where there is a reality TV series called “Teen Mom”. O’Neill, who is known for family dramas and tragedies, presented familiar themes but with a lighthearted air. Take the case of Sid Davis (Jonathan Lincoln Fried), the long-time gentleman caller of Essie’s live-in sister Lily (Kimberly Schraf). Despite a good run of sobriety, falls off the wagon during a Forth of July celebration. The results? A humorous family dinner where his antics are the main course. The subplot of Sid and Lily’s complicated relationship may have taken a different course in another O’Neill show, but is nothing but background business in this show. In the spotlight for most of the show is Richard and his quest to win the heart of his lady Muriel. Riley displays a true range of Richard’s character from naive confidence to the teenage angst. In any moment of opposition he is quick to turn his head and pout, a move that quickly solicits laughs but walks a fine line between funny and over-selling. In the later acts though we can’t help but laugh and sympathize with him. Rick Foucheux and Robinette are perfect as Richard’s parents. Robinette is especially funny in an argument where she flip-flops faster than a Presidential Candidate. The two play off each other very well and embody the Cleaver-like values of another time. Among the show’s supporting cast, Pearl Rhein has an underrated role as both a prostitute that Richard encounters and a violinist who anchors much of the show’s soundtrack. Director and former Arena Associate Artistic Director Kyle Donnelly keeps the action simple on Arena’s Fichandler stage using only a few house furnishings to show the Miller’s Connecticut home. However Donnelly and Lighting Designer Russell Champa create a wonderful ambiance in the show’s closing scenes. Ah, Wilderness! is cute, heartwarming, and a welcome departure from O’Neill’s other works. The three act production is a tad lengthy but with a third act that will have you laughing non-stop it is only a small flaw. Where other coming of age features such as Superbad or American Pie have become staples of our culture, Wilderness is a refreshing drink of water away from the rude and crude. Ah, Wilderness! 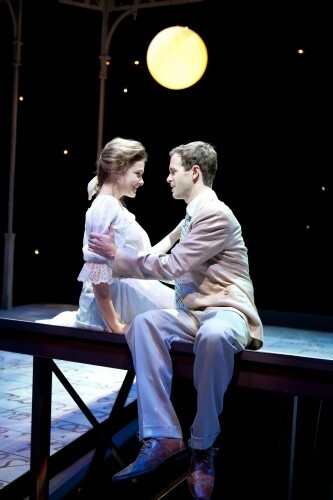 at Arena Stage at the Mead Center for American Theater, through April 8, 2012. Arena Stage is located at 1101 Sixth Street SW, Washington, DC 20024. Closest Metro stop: Waterfront (Green line). For more information call 202-488-3300.